You guys want some ROMs? Here we got some self dated 95 era FFL ROMs from same source. Later I will post the BIN in case anyone wants to DOS box it. ;    THE ASSOCIATED AUDIOVISUAL WORK IS STRICTLY PROHIBITED. ;           removed private hardware register definitions. I do believe the Jaguar has more secrets than Santa's bag of goodies. Always cool to see more stuff turn up about the console's history. It amazes me how the Jaguar and the 7800 were both programmed on ST computers. I wonder what Atari would have used for the 7800 if it remained under Warner's ownership? I don't think the ST would have been thought about nor exist. If I were in Jack Tramiel's shoes, here is what I would have done. I would have added 4 MB more RAM in the Jag. I would develop the software only on Atari and similar RISC-based computers, and more of the software titles for the Jaguar would have been produced. I would have used a killer marketing blitz, and since I am a graphic artist I might have done well. I would have released Black Ice/White Noise with the Nine Inch Nails soundtrack, and I would have made it easier to port ST and Falcon titles over to the Jaguar. That alone would have possibly produced over 300 titles for the Jaguar right away. Also, I would have released the MPEG decoder cartridge, fully completed, for the CD unit so it could play VCDs and other movie discs with MPEG-encoded software. Actually, I would have released the CD unit with a built-in decoder for MPEG compression. Atari had made many blunders, and these actions would have corrected them, IMHO. Well, most of them anyway. But, I could be 180º off on that as well. But, it would have been a better system if these actions were implemented. Also, I would shoot for more developers to be in the know on how to program this beast, which would make a lot of sense since it needed more developers to make games for it. This is a RISC-based system with five RISC processors in it. That is why the Jaguar can be hard to program for. But, hopefully, for home-brewers anyway, languages like Raptor BASIC+ will make it easier than ever before to make games. I would not mind learning it myself and working on my own games for it. But, I need to learn the language anyway, so it is wishful thinking. 4 MB of RAM? Yes. 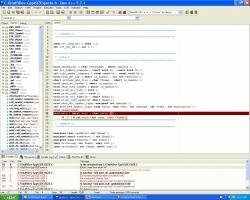 Developing solely on Atari computers? Maybe but makes sense when some ST models had the Blitter processor. Easier to port ST titles to Jaguar? Maybe. The library of games might have helped. But I remember ready Jaguar game reviews in magazines and every one of them praised the system but did not understand why it was getting ports of tired computer games. So, unless those games were missed by the public, porting ST games may or may not have boosted Jaguar. Here is what I would have done. Developed a more user friendly development package. One that is not so difficult to learn. Sign up more third-party developers. The likes of EA, Midway, and Activision would have been great. But, there are a few factors to weigh about Jaguar's downfall. Lack of third-party support, poor marketing strategies, and hard to understand development tools. But I believe the biggest factor was timing. Consider all the consoles at the time Jaguar came out. Sega had Genesis with a new CD add-on, Nintendo was busy with their new Super NES, NEC was toying around with their TG-16, SNK with NEO*GEO. A lot of consoles to go up against. Most of these consoles dealt only with 2D gaming. On the computer side, very little hardware was needed to play games like Doom. You really did not need fancy graphic cards as the graphics were generated by software for the most part. Jaguar was equipped with hardware 3D support, the first of its kind, placing it as the first console to do so. However, 3D gaming on the scale that Jaguar was capable of was a new concept. That jump had not been made prior on any console. Or modern computers for that matter. Jaguar was simply way ahead for its time but should be considered the console that started 3D gaming on a console. Imagine if Jaguar picked up ports of Konami's Castlevania and Gradius series? Or Capcom's Megaman series? Sunsoft could have jumped on and brought a Blaster Master sequel. Compile, creators of some of the best shooters on the NES and other consoles, could have brought some of those over to the Jaguar. There were so many aspects that could have been but never thought about or executed. Even if those developers used the Motorola as the main CPU to get their feet wet would have done some good to boost Jaguar's library. Always happy to see Jag ROMs turn up. Its cool to see what could have been. Developers solved the problem with the dev tools being unfriendly. Atari either yelled at them that that wasn't their job then ignored them and their accomplishments. We would have seen things on the Jaguar as-is that we haven't seen before on it.